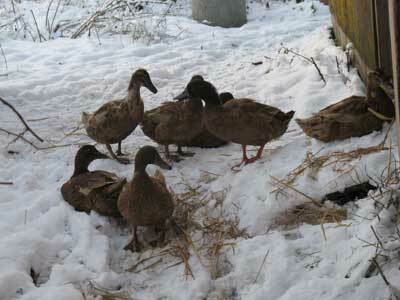 Well for the past few days with snow on the ground the ducks have been ground in their hut. I didn’t want them to come out of their hut onto the snow if it was going to damage their feet or legs. I wouldn’t fancy running about on snow in my bare feet so couldn’t see that the ducks would either! Anyway the ducks have not been very happy about being kept in for the last few days and this morning they seized their chance to do a runner whilst I had my back turned in the hut and I hadn’t closed the inner door properly. Ducks & drake enjoying the snow. Well I need not have worried. 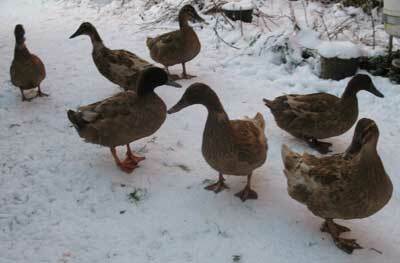 The ducks seem to have enjoyed running about dabbling in the snow looking for insects and bugs to eat. When they went to their pond and outdoor drinkers and found that they were frozen, there was alot of chatty quacking come from the ducks and drakes as they commented on the big freeze. Ducks and drake wandering off in the snow. I got them a big bucket of fresh water for them to drink and plunge their head into which they like to do. Ducks & drake waiting to go back into the hut. 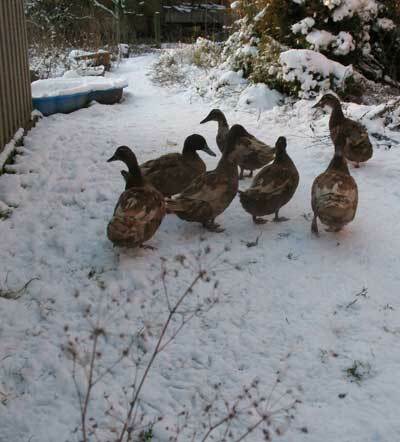 The ducks didn’t range around the farm as much as they normally do and stuck close to the farmyard. I don’t think they even ventured into the next door field that they usually love to spend most of the day in. 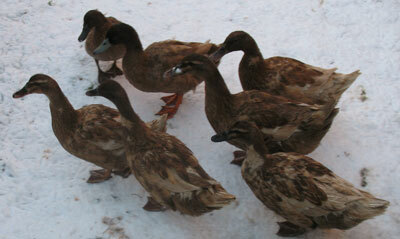 When I came out in the afternoon to round up the ducks they came to greet me and then ran off towards the hut. I was distracted by the cats and when I went to find the ducks again they were sitting infront of the hut door patiently waiting to go in. Obviously well trained.